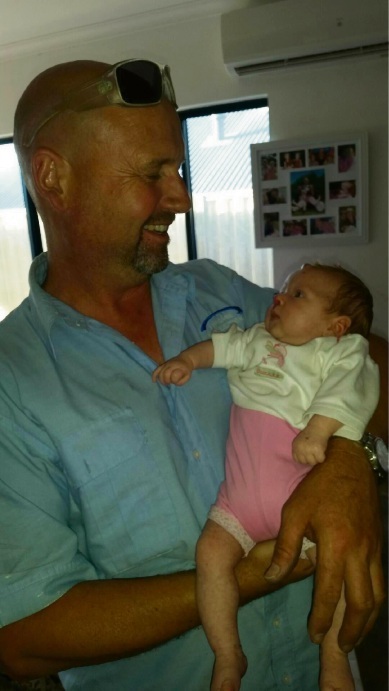 Mindarie Air and Electrical Services owner Kevin Hinds holding Phoebe Jury. A SINAGRA couple can help keep their terminally ill baby more comfortable thanks to a donation from local businesses. Hayden and Lisa Jury’s daughter Phoebe was born on October 4 and diagnosed with the rare disorder capillary malformation-arteriovenous malformation syndrome. The malformations have caused brain damage and for blood to flow fast into her heart, giving her congestive heart failure. Family friend Debbie Sullivan recently helped organise a donation of an airconditioner to help Phoebe cope in the heat. The unit was donated by Metalflex Wangara and installed by Mindarie Air and Electrical Services, totalling $2300. A Go Fund Me page created by Mrs Jury’s sister-in-law, which has so far raised $11,400, said the couple made the decision to take Phoebe home when she was two weeks old to receive palliative care so they and their two daughters could spend as much time with her as possible. Doctors had told them Phoebe could only have days to live but she continues to fight at nine weeks old. “The airconditioner will help with not letting Phoebe overheat and keeping her blood from pumping any faster around her tiny body,” Ms Sullivan said.“We are also hoping it will give Phoebe the strength to keep fighting as she is a real little fighter.